This unit pack is NOT a playable mod. Rather, it is a collection of slps put together to enable others to use these graphics for their own projects. If you wish to see (most of) these units in action, the easiest way is to play Age of Chivalry, which can be downloaded from the Blacksmith. You are free to use these units for your own projects as long as you credit me. I also encourage others to further modify these units and give them out for others to use. All units are contained in a separate folder with clearly labelled slps as well as unit icons. The README included in the zip lists the frame number of each slp as well as mentioning irregularities (such as missing slps). Kor's Unit Pack is a simple resource for modders to add additional units into their scenarios and Mod Packs. Many of the units in this pack are old units from Kor's famous Age of Chivalry Total Conversion. Coming directly out of the most famous and popular Mod Pack in AOK history, this unit pack is extremely useful. 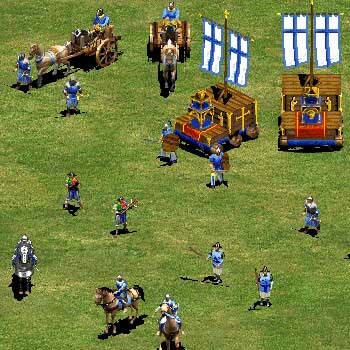 The units allow for more variety in the editor, especially for historical scenarios. The units are made really well and blend in excellently with the other graphics in the game. All of the units have been organised into their own folders and come with custom icons.